The Interior Design Society will be hosting our annual membership drive Oct. 1 – Dec. 12, 2014. Click here to learn how you can earn a free trip to Fort Myers, Florida, for 2015 IDS National Conference, a free year of membership or half-priced 2015 dues! The IDS National Office is currently in the process of issuing 2015 membership invoices. Please note that you have until Dec. 31, 2014 to remit a payment for your dues in order to avoid a lapse in membership. You have the option to conveniently pay your membership dues online. Login to your member portal on the IDS website (www.interiordesignsociety.org) and select "My Invoices" from the menu on the left side. Stay abreast on markets across the country by visiting the IDS Event Calendar. Click here to view it now. Are you the next IDS Designer of the Year? The 2014 application is now available. This year, the application and submission process are in digital format for the first time ever. Click here to learn more about the competition and how you can enter. Save-the-Date: The next IDS National Conference will take place in May 2015 in Fort Myers, Florida. More details will be released soon. Oriana's Design Finder: Search for the best. The ultimate find: a curated directory of the best trade vendors created exclusively for the interior designer. Save time and get organized! New products and vendors updated regularly. 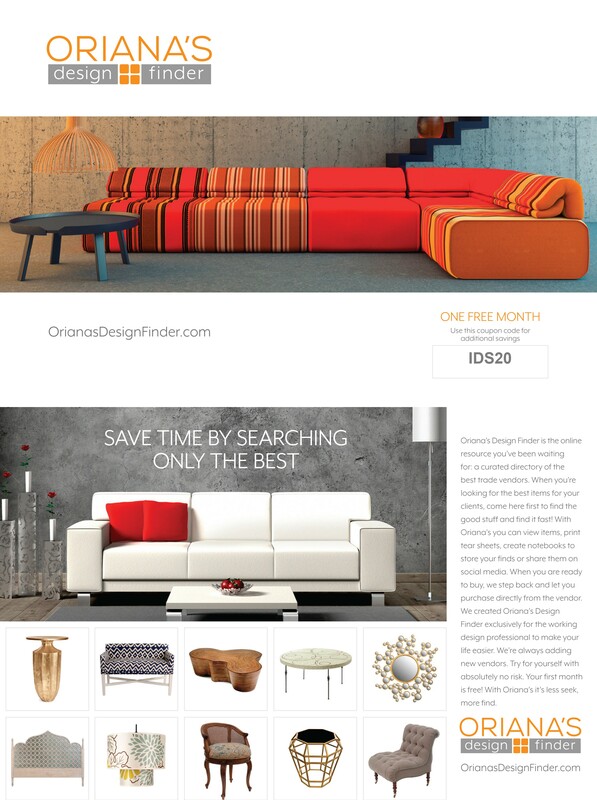 Visit OrianasDesignFinder.com to start your free month today! Sign up with coupon code IDS20 to receive your monthly 20% discount. Kravet Inc. - PID Sterling - Bethpage, N.Y.
KSA Bahareque - PID Sterling - Coconut Grove, Fla.
Leather Gallery and Bedding Center - PID Sterling - Sarasota, Fla.
Metro Blinds, Draperies and Shutters - PID Sterling - Fort Myers, Fla.
OMG Shower Doors - PID Sterling - Copiague, N.Y.
Samuel and Sons - PID Sterling - New York, N.Y.
Woodstock Architectural Products - PID Sterling - Las Vegas,Nev. Benjamin Rugs and Furniture - PID Sterling - Farmingdale, N.Y.
Francesco Molon - PID Sterling - Estero, Fla.
Grout Line Solutions NY - PID Sterling - Farmingdale, N.Y.
Ventura Builders Inc. - PID Sterling - Thousand Oaks, Calif.
LaMantia Gallery - PID Sterling - Northport, N.Y.
ArtyZen Studios - PID Sterling - Dix Hills, N.Y.
Save-the-Date: the next IDS National Conference will take place in May 2015 in Fort Myers, Florida. More details will be released soon! The Sarasota Chapter of the Interior Design Society is Hosting Its Fourth Annual "Party On The Pass" on Saturday, Oct. 11, 2014 from 6 - 10 p.m. Tickets may be purchased on the IDS website at www.idssarasota.com. Click here for more information. The IDS Chapter Awards application will be released in the coming weeks. Be on the lookout for its release! Would you like to get involved with an IDS Chapter? Visit our "Locate Your IDS Chapter" page on the IDS website to find out if there is a chapter in your area. To join a local IDS Chapter, you must first join IDS National. Click here to learn more about IDS membership. Randall Reynoso and Martin Camsey were remodeling their Monterey-colonial-style home in Sacramento, California, when life intervened. Reynoso, who works in banking, was transferred to his company's San Francisco office. Realizing he would need to be in the City by the Bay four days a week, he and Camsey started looking for a home there. It's a common enough dream for those who live in cramped urban spaces: Suddenly you notice a door you never realized was there and beyond it a room you didn't know you had — or maybe an entire wing of your home, just waiting to be occupied. Question: What's the hardest part of writing your speech? The results of this informal poll from LinkedIn revealed the biggest block to writing a speech is (drumroll please): Starting. We want to hear from you! We are currently working on developing new educational programs for our members and CQRID certified designers. Your input will help us find out what educational formats and topics are most beneficial to you and how we can make improvements for the upcoming year. The following survey should not take more than five minutes to complete. Your honest feedback is greatly appreciated and will help us better understand your needs and aid in the improvement of our educational programs. You may participate in the survey by clicking here. Thank you for your time. Don't forget that 0.8 CEUs must be completed by Dec. 31, 2014. If you have any education-related questions, please contact Melanie Hylton at mhylton@interiordesignsociety.org. Don't forget to view the available webinars on the IDS website through the LMS link! There are several available webinars by Tobi Fairley, each are worth 0.1 CEU. A new Tobi Fairley webinar was just posted, "How to Determine Your Staffing Needs." This session addresses designers who may be confused about when and how to hire people to handle a portion of the work for their design firm. If you need to know how best to keep your operation "lean and mean" yet still highly productive, this webinar will provide you with helpful information. Join Tobi Fairley for this training on determining your staffing needs and then taking action to get the job done! Visit the IDS website to learn more! Registration is now open for High Point Fall Market, Oct. 18 – 23. Sign up for your passes today! Author, speaker, educator and interior designer, Mitzi Beach, who has her Masters in Interior Design and is NCIDQ and CAPS certified, is America's No. 1 Expert in the housing and interior design issues facing the USA's 80 million boomers. She has developed a 4 hour HSW IDS, IDCEC and NKBA approved CEU course called #BoomerSmarts: Designing and Selling to America's Richest Demographic. This event will take place on Monday, Oct. 20 from 2 - 6 p.m. The cost is $250 for the 4 hour CEU. Click here to learn more and to register. Name: Lloyd Princeton – "Deciding What You Are Worth and Charging It"
While design professionals know how to design, they do not always understand what or how to charge for their services. Add into this the issues of dealing with long-term clients versus new prospects, and the situation is perfect to lose money. From the time of first contact with a prospect through the final closing of a deal, designers will learn how to determine the best way to charge for their creativity and incorporate it into a solid letter of agreement, with confidence! This event is worth 0.1 CEUs through IDCEC. Name: Terri Taylor — "How to Price and Profit From Interior Design Jobs in Today's Market"
Terri Taylor will explain the concepts and strategies to help designers develop a business where income flows freely, and business systems and marketing support solid business practices and creative expression. This event is sponsored by IDS and is worth 0.1 CEUs through CQRID and IDCEC. This presentation will provide an overview of the changes in color perception among the elderly as a result of aging or disease, with discussions of appropriate color use and application. This event is sponsored by IDS and is worth 0.1 CEUs through CQRID and IDCEC. Congratulations to all of our 2013 Designer of the Year Award Winners! Visit the IDS National blog to view photographs of the DotY Award Winners' designs by clicking here. The 2014 IDS Buyers' Guide is live. To find preferred IDS vendors, look for the IDS logo in their listing. If you are interested in obtaining a new listing or updating an existing listing, please contact Dan Sylvester at 212-920-3918. Click here to view the IDS Buyers' Guide. The IDS National Office is currently in the process of issuing 2015 membership invoices. Please note that you have until Dec. 31 to remit a payment for your dues in order to avoid a lapse in membership. You have the option to conveniently pay your membership dues online. Login to your member portal on the IDS website (www.interiordesignsociety.org) and select "My Invoices" from the menu on the left side. If you are interested in obtaining a membership certificate or replacement membership card, please contact IDS Benefits Coordinator, Della Swider at dswider@interiordesignsociety.org or call 336-884-4437 ext. 223 (please note for all replacement membership cards, there will be a $10 fee payable in advance for each replacement card ordered). There are 53 million unique monthly Pinterest users in the United States, and Forbes reports that is about 22 percent of all Americans, ahead of Twitter at 19 percent and about equal to LinkedIn.When it comes to marketing on Pinterest, many businesses are stuck and don’t know where to start. "Empty of all meaning and pathetic!" You expect to see comments like this following a politics story or heated argument on climate change, but as it turns out, the comments sections of interior design blogs and websites — ours included — give scientific debates a run for their money. Why get a personal secretary when your smartphone can organize your day, your minutes, your business trips and even your clutter? For entrepreneurs, having a smartphone loaded with the right kind of apps not only provides a way to hold you accountable for tasks at hands but also allows you to focus on what you do best: running a business. Four years ago interior designer India Mahdavi was working in her Paris office when she received a surprising call from longtime clients. The husband and wife, based in London, phoned to say that they had just purchased a house on 150 acres in Litchfield County, Connecticut. It was not to be a vacation home, as one might expect, but rather their primary residence — an epic move for the couple, considering how accustomed they and their young children were to city living. "Every step you take, every move you make." Sting wasn't singing about getting fit, but his ballad could become an anthem for the active design movement. Along with ways to make buildings more sustainable and healthier, researchers, professionals and governments are looking at how building design can promote physical activity as well. Growing concern about the health risks and high cost of obesity, overly sedentary lifestyles and poor ergonomics has pushed active design to the forefront of emerging trends in the building industry. Fred Berns, an award-winning coach, author and professional speaker who trains design professional, says: "I was a rookie reporter (get a load of that press pass photo!) years ago for a Milwaukee newspaper when one day a senior editor called me in for a story conference. As I listed the events I planned to cover that week, he suddenly slammed his fist on the desk." Are you ready to make a commitment to your professionalism? The CQRID Exam is the only accredited exam offered exclusively for Residential Interior Designers. For more information visit www.cqrid.org. This edition of IDS Hot Topics was sent to ##Email##. To unsubscribe, click here. Did someone forward this edition to you? Subscribe here -- it's free!